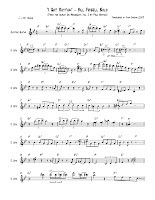 The Stringslinger: Bill Frisell Solo on "I Got Rhythm"
Bill Frisell Solo on "I Got Rhythm"
After reading through some forums there seemed to be others like me. Those who love listening to Frisell, but never took the time to sit down and learn a solo of his. I think I know why. His playing is so much about phrasing, tone and atmosphere. So just by listening you feel like you get an idea of what he does. It's more mindset than finger-practicing. Well, I finally finished my first transcription and I thought I'd share it. 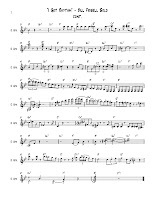 This Frisell solo comes off a Paul Motian album of standards called On Broadway, Vol. 2 . The reason I chose their performance of Gershwin's "I Got Rhythm" is simply because I was curious to hear what Frisell would do over rhythm changes. (For those who aren't familiar, "rhythm changes" is the term used to label the chord progression and form of "I Got Rhythm." Google it for more info) Any student learning jazz or improv from High School on up either learns to love or hate these chord changes. I don't HATE them, but I quickly realized that I usually don't enjoy improvising over them. So that was another reason for choosing this song: to get myself playing over rhythm changes again (at least for a little bit). Frisell grew up learning the language of be-bop, yet over the years he chose not to follow the typical approach (some may call it a "trap) too many players take (or fall into). He doesn't feel the need to outline every chord. He allows his playing to breathe. Something we guitar players tend to forget about since we don't use our mouth to produce sound (like singers, trumpets, saxes, etc). You notice that in the beginning he is thinking most in terms of the key of Bb, than individual chords. If you want to be specific: Bb Mixolydian (Bb-C-D-Eb-F-G-Ab) with the use of the raised 2nd (or minor 3rd). Immediately, the sound is very bluesy. In the second line, he then outlines the chromatic movement in the harmony. Something he continues throughout the solo. You could argue he doesn't show any "bop lines"until measures 11-12. The B natural comes from thinking G7 (instead of Gm7, a common substitution) and the F-E-Eb at the end of the F7 chord is one of the most common jazz movements over any Dominant 7 chord. (Start at the root and go: 1-7-b7-9-6-5. That's like riff #3 on the first page of How to Improv: A Guide to Make You Hopelessly Believe That You Can Sound Like Charlie Parker) I could probably write another 2-3 paragraphs analyzing his solo, but I won't bore ya. I tried to make this transcription as accurate as I could. Again, sorry this isn't in TAB. If you listen to the recording, you'll heard that he uses his volume knob during the solo. There are a couple nice 1/2-step bends as well. I notated those with the little bracket thingy. My favorite lick of the solo is on the second page. It occurs at the beginning of the second B section, over the D7. If you want something to practice in all twelve keys, that would be the one! I hope this interests some people and that you can take something new out of it. Enjoy, and thanks for reading! Hey thanks man! I'll definitely check yours out. So great! John, thanks so much for the transcription! Nashville-based guitarist and teacher. M.M. in Commercial Music (guitar performance) from Belmont University. B.M. in Commercial Music from Millikin University. Hope you find something of interest on this here blog. "I am a boy, and then I explode"